Naaldenstraat 22, 8000 Bruges, Belgium. 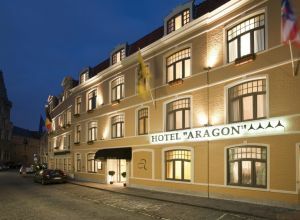 Hotel Aragon is situated in the historical center of Bruges at only 100 meters from the Main Market Square. The hotel has been renovated in 2008. All 42 hotelrooms are air conditioned and have TV, telephone, wireiess internetfax/modemline, free safe, minibar, private bathroom with bathtub, make up mirror, hair dryer and toilet. There are 2 elevators and breakfast is served in buffet style. * Holiday Apartments in Aragon House from 2 till 6 people. Paid open air parking at the hotel (25.00 €), Reservation obligated. Extensive breakfast buffet between 07.30-10.30h. No restaurant.